Meck feat. Dino. Feels Like Home (Radio Edit). MAYSKY.RU. MP3 МУЗЫКА. MTV DanceFloor Chart. Музыкально-развлекательный сайт. MP3, информация, биография, новости, фотографии, обои для рабочего стола, ссылки, рейтинг по каждому артисту, группе, исполнителю, DJ и по каждой песне! Feels Like Home (Radio Edit). 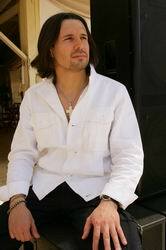 Craig Dimech is a managing director of free2air Recordings and also a producer in his own right. The name MECK has been everywhere of late thanks to the UK #1 smash hit single ‘Thunder In My Heart Again’. The record gained the support of among others Radio 1’s Pete Tong, who went on to play it for 10 consecutive weeks and made it his ‘Essential New Tune’. As people have subsequently found out, Meck is the DJ and recording alias of Craig Dimech, the head of free2air recordings, one of the UK’s most respected labels. Having set the label up a little more than 3 years ago, his A&R skills have secured three UK top #10 hits, four top #20 hits and countless scores of underground sensations which have placed free2air firmly in the epicentre of cool, clubbing culture. Craig started his career as a DJ in the early 90’s and was club resident at one of London’s most loved nights ‘Peach’ – which ran for a staggering 10 years, leading to guest appearances worldwide and a position in DJ Mag’s Top 100 DJs in 1999 at #90. The natural process to Craig was to then develop a keen interest in the A&R process of making and developing records, no longer content with just playing them. He soon became A&R manager for Ministry Of Sound affiliate label Incentive Music in 1999, where he went on to become Head of A&R, signing and developing such diverse acts such as Mario Piu, Matt Darey, Santos, Dino Lenny & The Genius Cru, all major hits in their own right. After 3 very successful years there he was then asked by Edel Records to start his own label. free2air was born in January 2003 and the rest is history as they say, scoring hit after hit at a time when most imprints were being forced to close. With the view that ‘the best form of defence is attack’, Craig scored Top #10 success with Jason Nevins, Narcotic Thrust & Mousse T before producing (with Marc JB & Lee Dagger) and delivering the #1 smash ‘Thunder In My Heart Again’. The opportunity has now arisen for Meck to mix the first compilation on free2air which is a blend of not only the hits but also provides a platform for the more underground side of the label tastes. ‘SET: MECK’ is the first in what is hoped will become a series of compilation releases. Putting together this compilation gave rise to the desire to get back to his roots and focus on his DJ-ing once more. He simply missed playing records! Having already played at Pacha London and giving them one of their most busy Friday nights in their history, Meck is ready to take the world by storm in 2006!! The revival of disco in dance music is upon us. 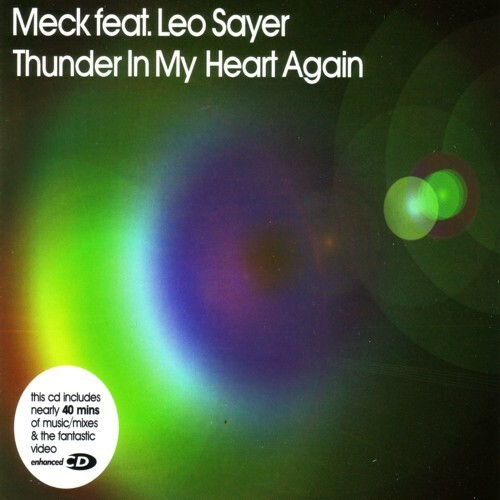 So what a find from the enigmatic DJ Meck, who dug up this old Leo Sayer record which, with a little added production, fits perfectly with what's going on dance music right now. "Thunder In My Heart" peaked at a modest no 22 for Leo in 197, following eight consecutive Top Ten hits, but now it will revive his career. Like Elton John's "Are You Ready For Love?" (not a huge hit at the time), we fear this is about to shame contemporary songwriting and record making by blowing them all out of the water. It's already being hammered by Pete Tong, and Jo Whiley is also a fan, calling this a "guilty pleasure" when she first played it on Radio 1. "Thunder In My Heart Again" is released on 6th February 2006.